As you can imagine the year has started with the usual mix of atrocious weather combined with quite pleasant milder days that are very fishable. After all the rain last week the fish are in fine fettle! It's been a cracking week with all the lakes producing well and most fishermen catching their bag. Fish continue to come out inspite of the very warm weather. The considerable quantity of rain this week has helped freshen things but I've been pleasantly surprised how well the lakes have been fishing. The weather has been a mixed bag with alot of rain causing some coloured water this week. However we have been busy with some good catches - just bring the right clothes! Having had some colder nights at the fishery the warm water has definately gone! All lakes are fishing well and it is especially good to see the Specimen lake producing consistently. The second heat of the Bellbrook Cup took place at the end of May and a challenging day’s fishing it was too. The weather was cloudy at first but still warm although there was one very heavy down pour - nothing these anglers couldnt handle! Tom West of Chudleigh caught this 13-2 monster on a Bloodworm. Tom was part of a family competition and won the day catching this with the last cast of the day!!! © Copyright 2013. 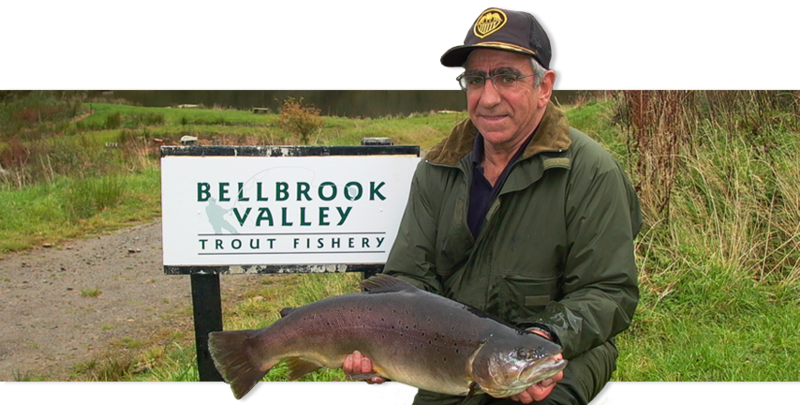 Bellbrook Fishery. All Rights Reserved. All Trademarks Acknowledged.